Both Haas drivers employed a one-stop strategy in the 70-lap race around Hungaroring. Grosjean, who started 10th, was the first to pit, bringing his Haas VF-18 in for service on lap 29, swapping his ultrasoft tires for softs. Magnussen, who started just ahead of Grosjean in ninth, followed on lap 31 and emulated the tire choice of his teammate. Grosjean dropped to 12th after the stop and Magnussen, who drove to as high as sixth at the start of the race, fell to ninth. But as pit stops began to cycle through, Magnussen rose to seventh and Grosjean climbed to 11th. "Both of us in the top-10 is really good," Said Grosjean. "The race was frustrating. We need to understand how to get the tires better in these circumstances. I spent 50 laps behind (Carlos) Sainz, being half-a-second to one second faster. As soon as you get close to the car in front of you, it just goes and there’s nothing you can do. That was a bit of a shame but, overall, I think we really did a great job. We jumped (Nico) Hulkenberg and (Brendon) Hartley, showing that we had an amazing pace. Generally, I think we had a great pace, so it’s good to have two cars in the top-10. We’ve had a really good weekend. The race pace was so much better than P10." When Stoffel Vandoorne was forced to retire his McLaren after 49 laps, Grosjean inherited 10th. 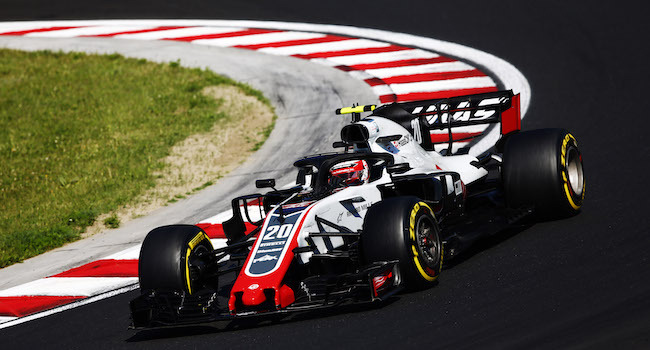 For the remainder of the race, both Haas drivers raced comfortably in seventh and 10th, respectively, with sizeable margins between the cars ahead and behind each of them. The finish extended Haas F1 Team’s streak of point-paying results to five, dating back to the June 24 French Grand Prix. “I was quite happy today. Had a good first lap, gained some positions, and took it home from there. Not a very eventful race, except for the first lap, but that’s fine for us. We scored a double-points finish for the team and that’s a good way to go on holiday,” Magnussen added. The seven points from the collective result of the Haas drivers at Hungaroring allowed the team to take sole possession of fifth in the constructors’ standings. The American squad now has 66 points and trails fourth-place Renault by 16 points, but has a seven-point advantage over sixth-place Force India, a 14-point gap to seventh-place McLaren and a 38-point margin on eighth-place Toro Rosso. Magnussen is eighth in the driver’s championship with 45 points and Grosjean is 14th with 21 points.